Atlanta was on fire as Gospel music's biggest and brightest stars, producers, and industry personalities invaded the city for The 16th Annual BMI Trailblazers of Gospel Music Awards. BMI Vice President Catherine Brewton described the event as a "homecoming". In past years the event was apart of Stellar Award Weekend, but when it was decided that The Stellar Awards would be held in Las Vegas, BMI decided to return "home" to its Atlanta beginnings. You could feel the electrifying energy the moment you entered the Rialto Theater in downtown Atlanta. For many, this was a reunion and the first time they saw their colleagues and friends in the New Year. The room was filled with the industry's top artists, songwriters, producers, and industry personalities. All of these people had gathered together to honor this year's honorees: Israel Houghton, LaShun Pace, and The Anointed Pace Sisters. The evening started off with prayer and an introduction by the BMI Team. Awards were given for the top performed Gospel songs of 2014. The #1 most performed song of the year was "The Gift" by Donald Lawrence, the leading single off his recent release: "Best For Last". BMI also recognized five additional opuses as Top-Performed Gospel Songs of the Year (2014): "1 On 1", written by Lucius B. Hoskins and performed by Zacardi Cortez; "Clean This House", co-written by Philip Cornish and Isaac Carree, who is the performer; "God Will Make a Way", written by Ay'Ron Lewis and performed by Shirley Caesar; "Here in Our Praise", co-written by Michael Bethany and Fred Hammond, who is the performer; and "It's Working", co-written by Aaron Lindsey and William Murphy, who is the performer. After the awards were handed out it was time for the tributes to begin. Hosts VaShawn Mitchell and Kim Burrell took the stage to introduce Gospel group Z'iel who sang "Safety Zone". The girls' high energy soaring vocals roared loudly throughout the theater and had everyone up on their feet. Following behind them was the now Grammy Award nominated The Walls Group. The group took the stage to sing "Contentment" written by Pace Sister, Latrice. LaTrice was moved to tears as she sat and watched her song come to life. LaTrice has served as a background vocalist for many years on the Trailblazers stage but this year was special as she was an honoree along with her sisters. The sisters sat with tears in their eyes as Donald Lawrence and Company did their rendition of the song "U Know" which included several reprises of the vamp. Next we were up on our feet as Dorinda Clark Cole sang, "Be A Fence", and adder her jazzy signature Clark vocals to the song. Mom and Daughter Duo Lisa Page Brooks and Tasha Page Lockhart sang the hit single, "When God Is In The Building" an added their signature "Witness" flare to the song. A unique performance of this tribute set was Anthony Williams (BSlade/ Tonex) performing the LaShun Pace classic, "I Know I've Been Changed". When Williams took the stage the place erupted with joy to see one of Gospel's own return home. The crowd sat with anticipation to hear the amazing vocal acrobatics that would come from his mouth. In a fatigue outfit he started the song off acapella in a smooth falsetto and later brought the band in and sang the song in full voice and with choreography. Everyone was reminded just how amazing talented Williams is. Kathy Taylor then sang "Just Because God Said It" and then Pastor Rance Allen kept the party going singing "He Keeps On Doing Great Things For Me". Allen got personal and talked about how he met the Pace Sisters and had dinner at their home many years ago and how their mother served them fried chicken and corn on the cob. When the sisters took the stage to accept their award and thank their labels that have supported them over the years. The sisters then grabbed the microphone and sang the vamp to their signature song "It's Already Done". See the numerous photos from BMI Gospel Trailblazer's Luncheon. Check out the full gallery (photo credits: Arnold Turner, Ben Rose ). There was a special tribute to the late Andrae Crouch that included a rousing rendition of "We Are Not Ashamed" performed by Pastor Donnie McClurkin and Yolanda Adams that had the crowd on its feet. Pastor Crouch was honored years ago with the BMI Trailblazers of Gospel Award. 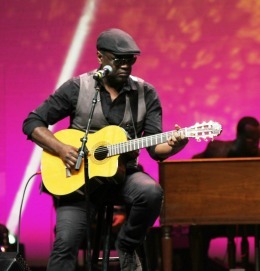 The finale of the event was the powerful worship tribute to Israel Houghton. 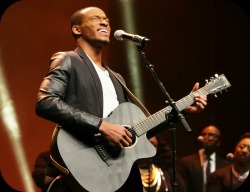 Micah Stampley started off the powerful medley singing "Another Breakthrough". From the moment Micah opened his mouth, you could feel the power and presence of God in the room. Tears flowed from Micah's face as the song became more intense and the band proceeded to flow into "Lord Of The Breakthrough". In the same vein of worship Tasha Cobbs hit the stage to sing "Alpha and Omega". Cobbs hit the floor in a beautiful white suit and began to worship causing the entire atmosphere to shift. To end the set Jonathan McReynolds did an acoustic version of "Moving Forward" which ended with Houghton taking the stage to sing. BMI held true to their standard of elegance, power, and class. The one statement that held true to those who were honored was, "You Are Not Forgotten". Those simple words served as encouragement to not just the honorees but all those in attendance. All content in GOSPELflava © copyright 1997 - 2015. No information to be reprinted or re-broadcast from this site without the expressed written consent of GOSPELflava.com. All rights reserved.